THE HAND-OFF: Drive-thru spot Mix’d Up Truck Stop serves loaded burgers. Ah, the drive-thru. Delightfully speedy, unabashedly lazy, and thoroughly American right down to its spelling yet already something of a relic in these days of apps and swipes and UberEATS. Perhaps it’s because we’re such a city of cars, or perhaps it’s because of our history, but here in Atlanta, the good old-fashioned drive-thru still stands strong. While we didn’t invent the concept (that honor goes to Red’s Giant Hamburg in Missouri), we do hold the title for world’s largest drive-in, the de facto, Southern-born predecessor to the modern drive-thru. Ye olde Varsity, open since 1928, experienced its heyday in the '50s and '60s when singing carhops and dates at the drive-in reigned supreme. Today, most of the action happens inside the bustling 800-seat restaurant, but you can still pull up at the carport outside for a Frosted Orange and two chili cheese dogs all the way delivered straight to your driver’s side window. When it comes to eating from the comfort of your automobile, Atlanta extends far beyond multi-national super-chains like McDonald’s and even regional favorites like Chick-Fil-A and Cookout. Here, you can drive your way through the culinary spectrum, from tacos to doughnuts, burgers to booze. So join us on a brief tour through some of Atlanta’s distinctive drive-thrus. No shoes, no pants, no problem. “El Taco Veloz: drive right the bleep up and get yourself some authentic bleeping deliciousness,” Anthony Bourdain says in the Atlanta episode of his erstwhile Travel Channel show “The Layover.” He is not wrong. This no-frills taqueria has been serving Mexican-born founder Filiberto Prieto’s hearty family recipes out of its original Buford Highway location for 20 years. 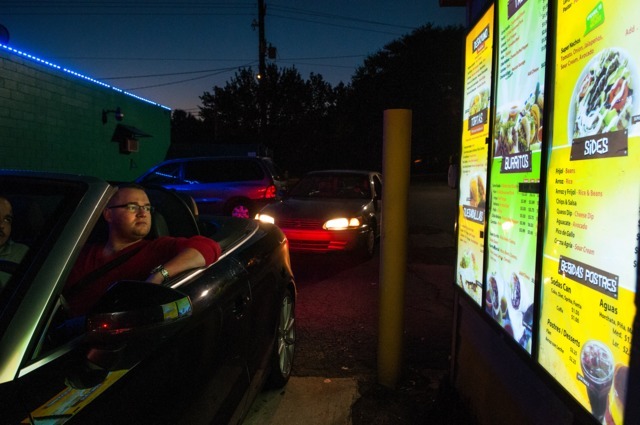 WHAT'LL YA HAVE: El Taco Veloz's drive-thru stays open till 4 a.m. on weekends. There are a few tables inside and a small patio out front, but your quickest option is the drive-thru window, which takes orders in both English and Spanish and stays open until 4 a.m. on weekends. The burritos are thick and meaty and the tortas are fluffy and oddly satisfying (the Cuban has hot dogs in it), but tacos are your best bet. They cost around $2 each and three will make a meal. Try the richly seasoned grilled pork pastor with its earthy cinnamon undertones or the Bourdain-approved taco de lengua — chunks of melt-in-your-mouth beef tongue double-wrapped in soft corn or flour tortillas and paired with spicy salsa verde. Word from the wise: If you try to eat these things while driving, you will end up with a lap full of meat juice. 5084 Buford Highway. N.E. and other metro Atlanta locations. 770-936-9094. www.tacoveloz.com. This Brookhaven doughnut shop opened less than a year ago but has already scored some serious cred both locally and nationally. It was featured on the premiere of Food Network’s new show “Vinny & Ma Eat America” (starring Vinny Guadagnino from “Jersey Shore,” who was especially enamored with the margarita doughnut served with a shot of tequila) and a silver medalist in CL’s Ultimate Atlanta Doughnut Smackdown, thanks to the light-and-fluffy lemon meringue pie doughnut. SUGAR HIGH: Bon Glaze's flavors include bacon butterscotch, key lime, and Reese's peanut butter. Owners Kenny and Kelly Keith serve up a variety of picture-perfect doughnuts made from scratch alongside fresh coffee, bon bons (their version of doughnut holes), Liege waffles, breakfast sandwiches made with doughnuts instead of bread (hooray! ), and bacon four ways — wood smoked, candied, cayenne candied, or dipped in chocolate. As long as you have plenty of napkins, the menu lends well to the art of eating while driving, which makes the drive-thru component especially useful. Order a single gourmet doughnut for $2.50 or a dozen for $27. 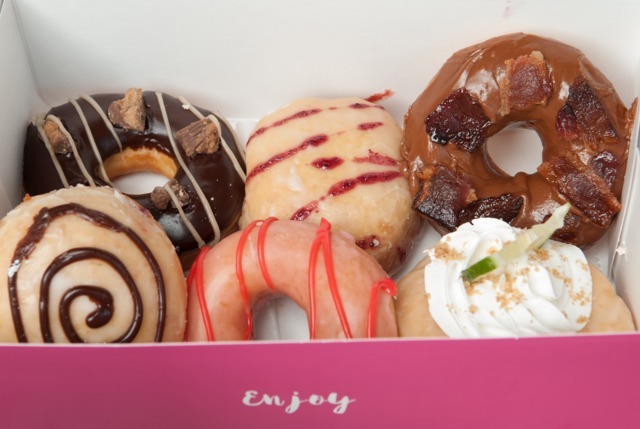 Favorites include the key lime with handmade cream cheese filling, graham crackers, and velvety whipped topping, as well as the seriously decadent bacon butterscotch — a luscious yeast doughnut with butterscotch glaze and candied bacon pieces. Success has allowed the Keiths to open a second location in Buckhead with a walk-up window in lieu of a drive-thru for those who'd like to burn a few calories before packin' 'em on again. 3575 Durden Drive N.E., Brookhaven. 678-691-4534; 3794 Roswell Road. 470-428-2569. www.bonglaze.com. Not long after the recession hit, chef Brett Eanes moved from L.A. to Atlanta with a dollar and a dream (no, really, he says, one dollar). With a fine dining background and a food truck bought cheap, he decided to shift his business to burgers. But not just any burgers. Tricked out, no holds barred, thick and juicy ones like the Rockin’ Hero Bite, a lamb burger with feta and tzatziki, or the Pile, an Angus cheeseburger perched atop a mountain of hand-cut cheesy buffalo fries. COME TO MY WINDOW: Mix'd Up's employees often joke with customers as they order. After a few years of successful food trucking, Eanes renovated a boarded-up drive-thru in Grant Park and opened his first brick-and-mortar location in 2012 near the corner of Boulevard and Memorial. (A second location in East Lake has just been announced for next year.) The Mix’d Up Truck Stop, as it’s called, brings a personal spin to the drive-thru game. “We’re a non-corporate, crazy group of folks,” says Eanes of his team, who he encourages to interact with customers beyond the typical here’s-your-food, gimme-the-money exchange. “People will be like, ‘I’ll have an ummm…’ and we’ll say, ‘I’m sorry, we just sold the last ummm…’ Or use a Pulp Fiction take line: ‘How ‘bout a tasty beverage to wash that down?’ We have fun.” 313 Boulevard S.E. 404-963-2381. www.mixdupfoods.com. 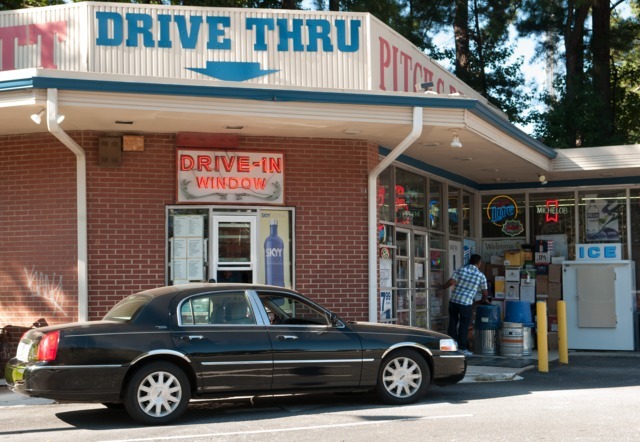 There are only a few states where drive-thru liquor stores are legal. Lucky for us, Georgia is one of them. Named for its original location’s proximity to the East Lake Golf Club, Atlanta’s own Pitch ‘n Putt has been supplying thirsty golfers on Glenwood Avenue and lubricating Emory frat parties from its second location on Johnson Road since 1960. The shop runneth over with a variety of liquor, ranging from cut-rate handles to top shelf spirits, along with a decent selection of wines, craft beers, and plenty of the cheap stuff. Pull up to the drive-thru to select from typed-out lists taped to the window beneath an elaborate neon sign. Wines are listed by varietal while beers are divided by the size of the pack and include several local brews. Names are casual approximations — there’s “Monday Drift Kilt,” “Jekyll Hot Dang Dignity,” and the mysterious “Poopy," which turned out to be Poppy’s Monterey County Pinot Noir. The dudes working the window are friendly and quick, and they’ll even hand out free dog biscuits if Fido came with. Because everyone deserves a little love down at the drive-thru. 1890 Johnson Road N.E. 404-875-6073; 2351 Glenwood Ave. S.E. 404-377-6801.